The development and design of novel processes for the fine chemical production from sustainable feedstock requires a careful and thorough investigation and characterization of the new and more complicated systems. Upon introduction of novel substrates, the chemical and physical-chemical properties of the different reactive systems may change and need to be characterized. In project area A, the thermodynamic properties and reaction kinetics of complex solvent mixtures in different solvent systems (thermomorphic and micellar solvent systems and pickering emulsions) are being investigated. The results from project area A provide the physical and chemical foundations for further process design and optimization. 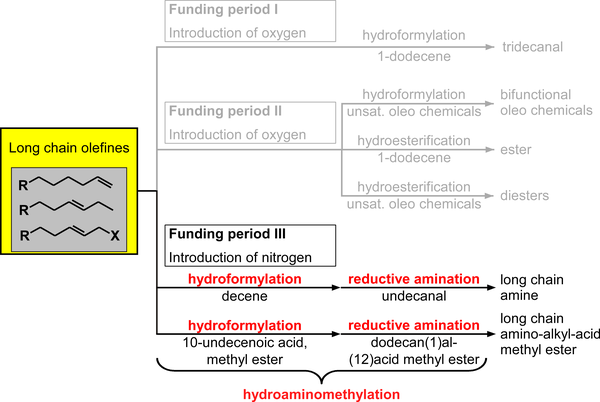 Systems of interest are the hydroformylation reaction of long-chain olefins and the reductive amination of the generated aldehyde to a tertiary long-chain amine. The tools and methods applied in this project area range from macroscopic descriptions of the gas-liquid transport to the characterization of the thermodynamics of mixed-solvent systems under process conditions and the development of reaction kinetic network models. By design and control of the process, the chemical reactions are controlled to produce the desired product in high yield and purity.